People all over the planet are looking for change and hope. Yet for all the talk radio shows, political rallies, cable news pundits, financial bail-outs, and global summits; humanity remains in a state of perpetual unrest and deep, soulful disquiet. Mankind is discontent and empty, searching and groping for answers—for salvation. Amidst this growing and discouraging state of concern and despair, there is a different perspective altogether. There is a group of people who see present-day events through a different lens. Their paradigm is not shaped by cultural trends or current events. Their hope is not found in humanity. They are not looking to politicians, economists, or educators for salvation. They have a completely different understanding of world events, their place among those events, and where the times are truly leading. As if watching the global stage from a front row seat in a spectator’s grandstand, they look on as participants with a larger perspective. Theirs is a grander context that sees current events not as chance or fate, but rather determined destiny. They see the direction of the world and the progression of humanity through the lens of God’s written Word, and they connect the dots that merely confound the wisdom of world leaders. These are the people who know the Truth. They know Jesus Christ, and they rest in His sovereign plan for the ages. They know that current events are but a small part of an eternal purpose unfolding by God’s timetable. They know peace, because they know the Prince of Peace. They know hope, because of an empty tomb. They know promise because they trust the God of exceeding great and precious promises. They know courage because their confidence does not rest in the political or economic processes of men, but in the powerful hand of an almighty Father. This book will help you live with peace, courage, confidence, and joy in the midst of restless and uncertain times! 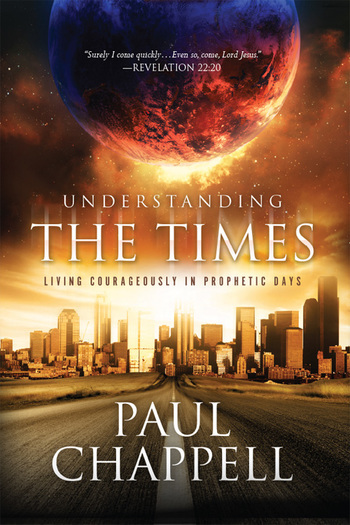 Every chapter will unlock the truth of Bible prophecy and help you see it connect clearly to present day events. With riveting imagery, captivating examples of currents events, and thorough biblical insight, Dr. Paul Chappell will help you have a heavenly perspective on present day events. Through this study, you will discover how to live with hope, anticipation, and expectation as God’s plan for future history unfolds before our very eyes!